I am extremely excited to welcome Deborah Coonts to Booking Mama. I recently read both of her Lucky O'Toole novels -- WANNA GET LUCKY? and LUCKY STIFF. You can read my reviews here and here. I hope you enjoy Ms. Coonts's guest post as much as I did. I think you'll get a great idea about not only her background, but also her personality and sense of humor! I know a lot of writers and they each have their own reasons for writing. Some love to play with words. Some love to craft devilish plots. Some love the fantasy. Me? I write because I am eminently unemployable. I don’t play well with others, never did. And my mind seems to jump around like a water droplet in a hot skillet—either I am insatiably curious or I’m gluten-intolerant and have ADD—either way, boredom is an issue. I can’t imagine doing the same thing over and over, day in, and day out. If that had been my life, I would’ve punched my own clock years ago. So, I make stuff up. It’s safer that way. Trust me. According to my mother, I was born be a professional liar. However, back when my talent first reared its ugly head, I was punished for it, now I’m paid for it. Go figure. Ironic, isn’t it? There’s a lesson in there somewhere and it is this: find your best thing and go with it. You laugh at the simplicity or even the innocence, but doesn’t it have the ring of truth? I know it does, you see, I’m proof. A good observer, I learned early on that I was expected: to speak only when spoken to, to consider anything written by Emily Post to be second in importance only to the Bible, to be fluent in china and silver patterns and, to aspire to marry the scion of some oil family and join the Junior League. And if my husband was voted in as a member of the Dallas Country Club? Well, I would have achieved far beyond my potential. You see, I was raised in Texas during the last gasp of the Donna Reed era. Suffice it to say, brainpower was not in the top five traits most admired in a woman. Hell, it probably didn’t even make the list. My grandmother used to tell me I was smart enough to play dumb. Apparently, she wasn’t accurate in that assessment. So, I retreated into stories where adventures awaited and I could be anything, do anything—the world was my oyster. Unfortunately, this forward-thinking ideal hadn’t reached my little corner of the universe. I was told I had to become an accountant. I loathed accounting. Thus began a duplicitous existence. I studied accounting, but I also majored in kinesiology (Heretic that I was, I thought I wanted to be a doctor). I turns out neither was a good fit. But I didn’t know what was. I mean, who announces at twenty she is going to make a living as a novelist? Certainly not the little girl who was told she could aspire no higher than the Junior League. A great disappointment to my southern friends and knowing there had to be more, I launched myself into the adventure of life. I’ve been everything from a mom (life’s very best adventure) and a wife (I’m not so well-suited for this one), a tax lawyer (boring), a business owner (close), a pilot and a flight instructor (sometimes too much of an adventure). A veritable Walter Mitty, my well of human experience is deep. And since you gotta live it before you can write it, I’ve come full circle back to my best thing. But it wasn’t quite that simple. Oh, I started putting words on the page—long, rambling sentences, too much backstory, plots with holes you could drive a tank through, purple prose…drivel. But I was writing! Watch out Sandra Brown! And, over fifteen years later, I’m an overnight success. Along the way I put in my 10,000 hours, my million words. And I learned some things along the way: I’m no Sandra Brown…no, I’ve got way too much funny bone. And I’m not terrified to speak in front of a crowd. Apparently I’m over 40/64th hambone. Who knew? God, don’t give me a mike and an audience, you’ll regret it. And I have a terribly inappropriate sense of humor, as my mother would tell me. To be honest, I like that part. Deborah Coonts's mother tells her she was born in Texas a very long time ago, though she’s not totally sure—her mother can’t be trusted. But she was definitely raised in Texas on barbeque, Mexican food and beer. She currently resides in Las Vegas, where family and friends tell her she can’t get into too much trouble. Coonts has built her own business, practiced law, flown airplanes, written a humor column for a national magazine, and survived a teenager. She is the author of the Lucky in Vegas series, featuring Wanna Get Lucky? and Lucky Stiff. 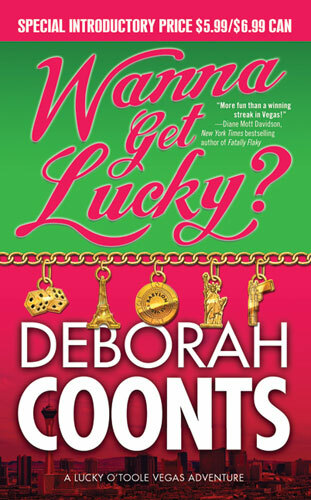 Giveaway alert: Since I just think these books are so much fun, I have a copy of WANNA GET LUCKY? to share with one "lucky" reader courtesy of the publisher. To enter just fill out the form below before Sunday, February 27th at 11:59 p.m. ET. I will randomly select and notify the winner the following day. This contest is open to those of you with U.S. addresses only. Good luck! I guess there's hope for all the kids of today who are trying to lie their way out of trouble! What a fun guest post! What a great guest post! Flight instructor would definitely be a bit too adventurous for me.